Hi, we’re Sam, Adam, and Egle from the Local Digital Collaboration Unit and Matt from the Digital Land Team at the Ministry of Housing, Communities and Local Government (MHCLG). We work as Collaboration Leads, supporting the 16 projects that have been funded via the MHCLG Local Digital Fund. Our mission is not only to help each project produce useful lessons, but also to work out how to solve problems common to many local authorities. We want to understand how these projects start and identify the right partners and resources, how they produce trustworthy work, and how their lessons and products can be used nationally to avoid waste and help improve the local government IT market - in line with the principles of the Local Digital Declaration. So, since December we’ve been regularly catching up with project teams, attending show and tells and workshops, gathering information about how the teams are working, and the directions their projects are taking. We’re also busy looking for opportunities to promote the best bits of those projects and identify areas where the teams are producing something that could benefit local government as a whole. Each of the 16 Local Digital Fund project teams attended the kick-off workshop in December. Strangely, we’re starting off by thinking about the future. 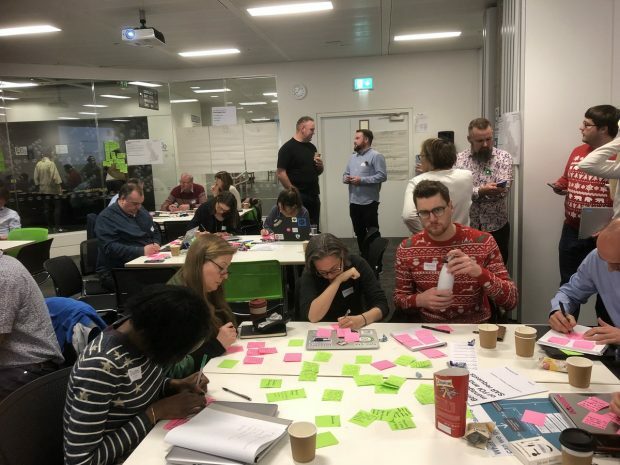 We believe that using agile methods, collaborating with partner organisations, and working in the open will produce better outcomes for our projects and mean that they continue to be valuable - regardless of whether things go as originally planned So we’re tracking how far our projects are adhering to those principles. Are the team building understanding of, and interest in their work by working in the open? Are they blogging or writing Weeknotes? Are they using public Trello boards or live streaming their show and tells? Are other authorities or public sector organisations interested in the work? Are the team collaborating effectively with their partners and are they using community events to build partnerships with the wider community? Partners or stakeholders growing over time suggests demand from the sector and may indicate value, lack of interest may indicate that local authorities have a larger or more pressing issue that they need to solve first. This will help us to prioritise those areas most in need of further funding. And we know collaboration isn’t easy, many of our funded projects have named contacts within other organisations but those people may not be the right people to speak with. Collaboration has an overhead. It takes time to get the right people in the room, so we’ve also been thinking about how we can help. 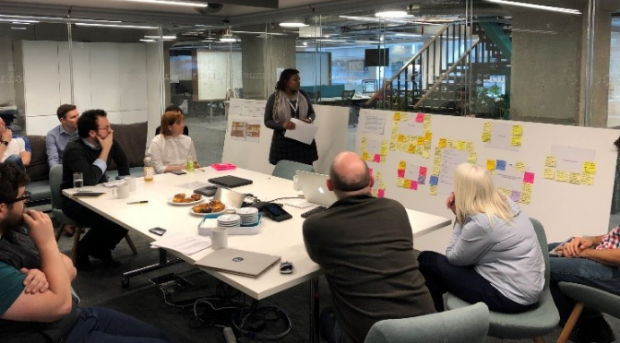 We’re interested in whether teams are able to work in an agile way, particularly as they progress through the phases of discovery, alpha, beta and live. We’re looking at whether they’re empowered to stop or change their approach based on what they’re learning. How likely is it that the team will come out with a feasible approach to solving the problems they’ve set out? This is down to how much discovery work the team are undertaking, how much they know about the context of the problem they’re investigating, and also how much user research they’re doing. What methodologies are teams using and how many people have they spoken to? Are they able to articulate their user/s in an easy to understand way? Ultimately, we want to figure out how to get great solutions developed in one area to be reused by any organisation that would benefit. So, we’re interested to see how teams are engaging with partners, and how well they understand how their work affects others. Do they have enough information about the bigger picture to know how an approach might scale at a national level? We’re looking at whether teams are actively seeking out partners with different contexts to them to understand how approaches may need to differ. The Children’s Statutory Returns project has recently identified coding issues for statutory returns across three authorities. By mapping these errors they are able to see contextual differences in how authorities are working on this problem. Through documenting these issues in the open they are likely to help solve problems for a wide range of authorities, as well as helping the Department for Education understand the problems that Local Authorities are facing when making statutory returns. 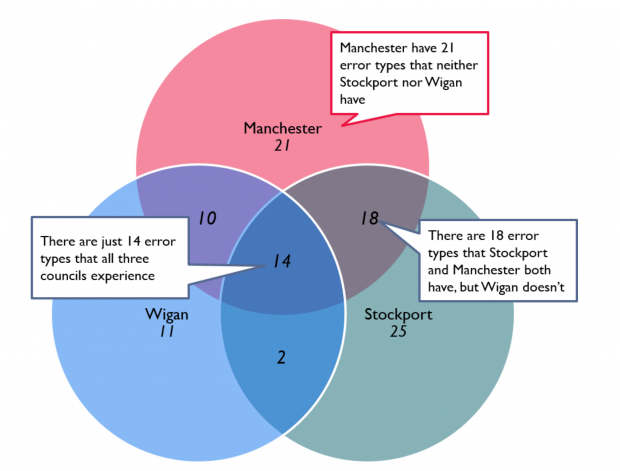 A Venn diagram from the Greater Manchester Combined Authority, explaining how error types are distributed across three local authorities. We’re seeing lots of interesting or exciting by-products emerging from the projects. These all vary in size and impact but could be really useful to other organisations if they could be collated in a useful, easily searchable way. Our team are tracking these byproducts to see how we might make other Local Authorities aware. For example, the Worcester Office for Data Analytics Registration Services Data project team, have recently made a request to the General Registers Office for Registrations Data. This is the first request of its kind under the Digital Economy Act so by simply documenting the process that they have gone through to obtain data; providing an overview of timescales and formats for receiving it the team are already producing something of value for the wider community who are considering making an application. 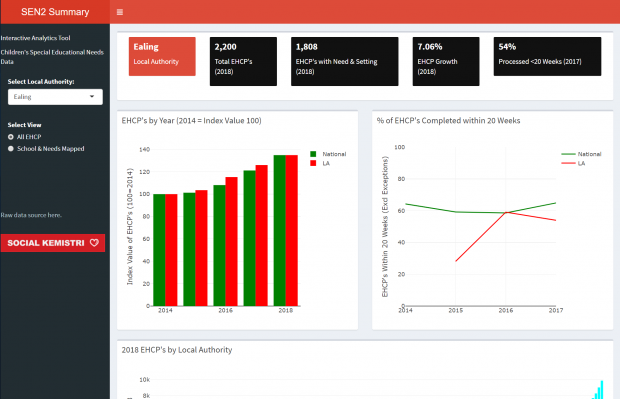 The Using Analytics and AI to aid the production of EHCPs team from Ealing Council are looking at ways that AI might be used to help the delivery of Education Health and Care Plans. As part of their work they have brought together all of the national data sets showing special educational needs data and have created a simple dashboard covering all local authorities. A screenshot from the Special Educational Needs dashboard by Ealing Council. All of the above should help to give us a really good idea about how valuable the project will be to the wider sector. We’re working with our Economist, Rushi, and with project teams to think about which of our projects might produce outcomes that will have the biggest financial benefit to the sector if they were scaled up and used nationally. We’re supporting our teams to build business cases that not only focus on the financial benefits of their work in their immediate authorities, but also expose the wider impact it could have on the sector as a whole, looking at immediate and longer term savings to understand which will bring the most value to the sector. We’re also looking for where there might be wider societal impacts arising out of the work. For example, the Family Context in Children’s Services project being run by Stockport is looking at how bringing family context data together can help them to make better decisions. While some of this value will come from monetary savings related to keeping more children out of care when they don’t need to be there, or through savings with commissioning, there are also wider societal benefits to the work. The Family Context in Children’s Services project team reviewing User Research with Social Workers. The team have been working with Social Finance, who have previously published a report called Leaving Care, Leaving Well, which highlighted how there is a 23% increase in the number of young people experiencing mental health issues after leaving care, and 40% of care leavers aged between 19 and 21 are not in education, employment or training. Better decision-making informed by this project could help councils meet young people’s needs more effectively and help reverse these trends. Funded projects will start submitting their project outputs in April for ‘discovery’ phase projects and in May for ‘alpha’ phase projects. They’ll submit a user research report, a benefits case, and a recommendation for what should be done next to realise the benefits and meet the needs they’ve identified. Alpha projects are also required to submit a prototype product, such as a first draft tool that they think meets some of the needs they’ve identified. We’ll use these outputs to learn how to better support collaborative projects in the future, sharing them all openly and possibly identifying templates that will make this kind of work easier for project teams next time around. We’ll also analyse the outputs to understand how best to invest the remainder of the Local Digital Fund. We want to make sure that some of the projects get to later stages of development, and help us learn about the tough task of driving reuse of something proven to be widely valuable. So, this may mean investing more money in less projects in future rounds. We’ll be sharing all project assets and lessons on our website. So, where it’s clear that there’s value in progressing some projects that we can’t directly fund, we hope that the tools and benefits cases we share will ensure that as much good work as possible gets taken forward. You can find out more about all of the funded projects on our website, and find links to their open working updates there too. You can also stay up to date by registering for our newsletter and following us on Twitter @LDgovUK.